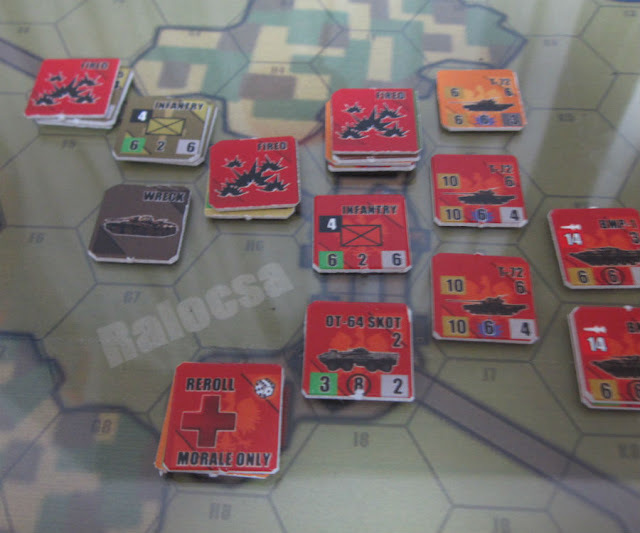 The Hungarians set their infantry and APCs to the south of Ralocsa, unsure of what to do with them. 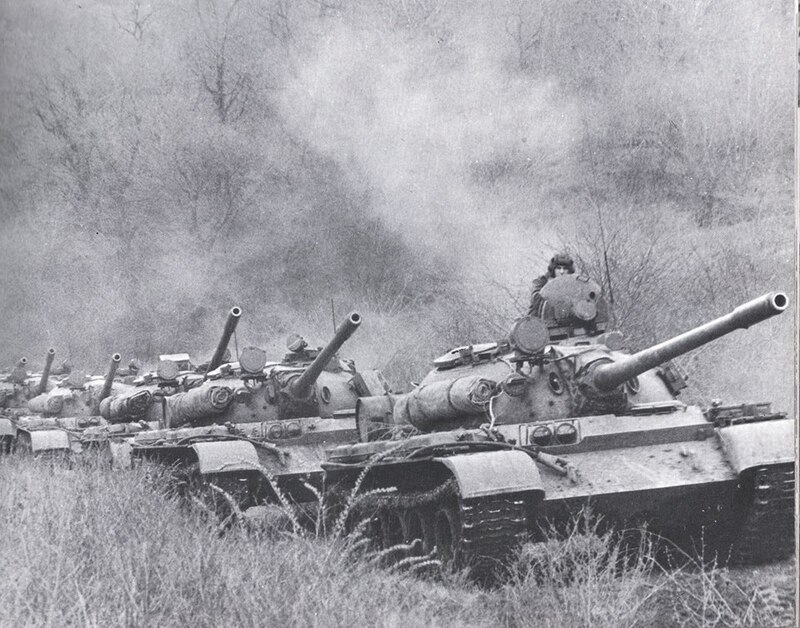 Two T-72s set up on the hills way to the south with a clear field of fire towards enemies approaching from the north. A Hungarian infantry team with Sagger sets up in E6 in the forested hillside hex. The Polish setup near Zelin. 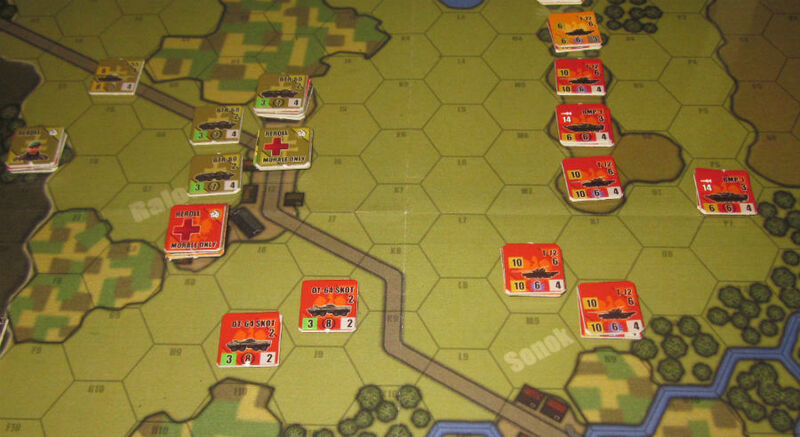 OT-64s full of infantry and an infantry with Sagger in the Q12 hex. The Poles win initiative and promptly begin firing at one of the T-72 platoons on the hills to the south, eliminating it. The Polish T-72s and BMPs enter en masse and the Hungarian player drops a 'Chemical Warfare' card that targets one hex and all units in the six surrounding hexes. 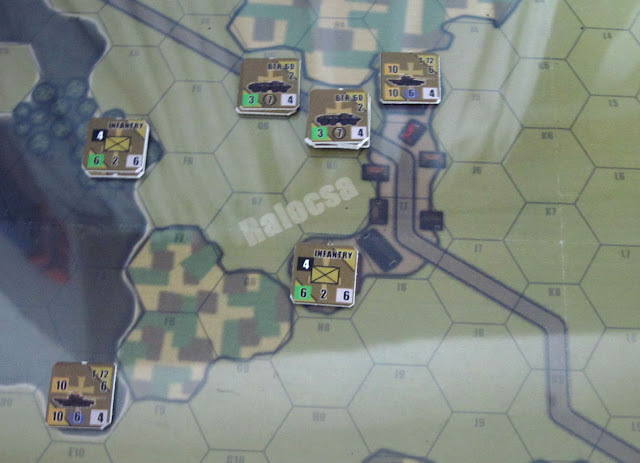 The Polish army is devastated by the attack, suffering numerous disruptions and three reduced units, including BMPs carrying precious infantry for the expected close assault on Ralocsa. Polish units are disrupted and reduced to a chemical warfare attack. The only good news for the Poles is that their morale increases from 3 to 4 as per the effects of a chemical attack. I guess this really pissed them off! The Hungarian player draws a BMP-1 as reinforcement and places it far to the southwest on the hillside overlooking the northern approach to the city. 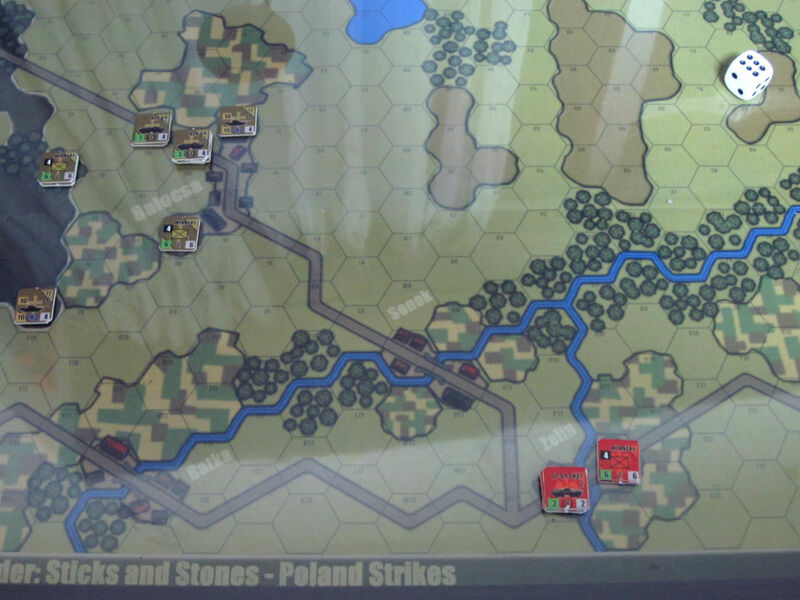 The Hungarians win initiative by rolling a 2 versus the Polish roll of 1. Both sides draw action cards. The Hungarians get 'Fire Support' (add 2 to firepower). The Poles draw 'Orlik's Ghost', which adds 2 to an AFV's range. In the rally phase, the Polish player rolls horribly. A slew of 6's results only in the BMP-1 in hex T4 rallying while all the other disrupted units from last turn remain disrupted. The Hungarian BMP fires and disrupts a T-72 in Q7, further messing up the Poles' start to the game. Later on in the Fire phase when the Hungarians go for another shot at the same tank, the wily Polish player drops his 'Faulty Ammunition' card. This shifts the Hungarian BMP's attack column one left on the FRT and the T-72 remains untouched after shaking off 3 hits. End of Turn 2. The Poles have a hard time getting going after the chem attack from last turn. A closer look at the state of Polish forces near the end of turn 2. The Hungarians have drawn a T-55 as a reinforcement for the Movement Phase and push the aging hulks down the road from the A2 hex. Hoping to avoid fire from the Poles' Sagger team to the east, the Hungarians relocate their T-72. The Hungarian BTR's prepare for the coming assault on Ralocsa by dropping off their infantry in the city. The Poles win initiative even after the Hungarians roll low and then reroll using a focus marker. The Polish player draws 'Za Polske! ', which gives a bonus to Close Assault. The Hungarian player gets 'For Izolda! ', which gives a bonus to rally. 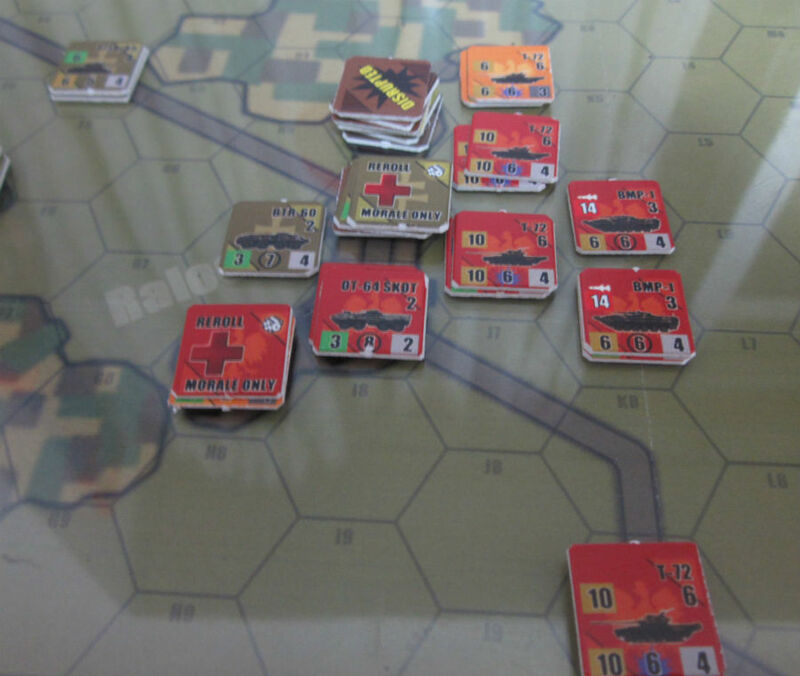 During the rally phase, the Polish player manages to rally a couple of units though a few T-72s are still unable to get going. In the Fire Phase, the Poles finally came online. With the help of 'Orlik's Ghost', the Polish BMP-1 fires its Saggers from beyond long range and it destroys the enemy Hungarian BMP. The Poles try to follow up by firing their Sagger at a Hungarian T-72 but doubles are rolled and the Sagger team is out of ammo. 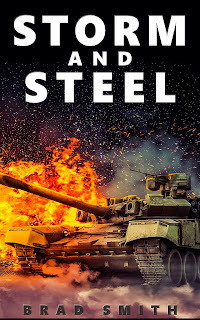 A pair of Polish T-72 platoons get it right by killing a Hungarian T-72 in hex I5. The Poles go first during the Move Phase and they start to line up their forces for an assault on Ralocsa. 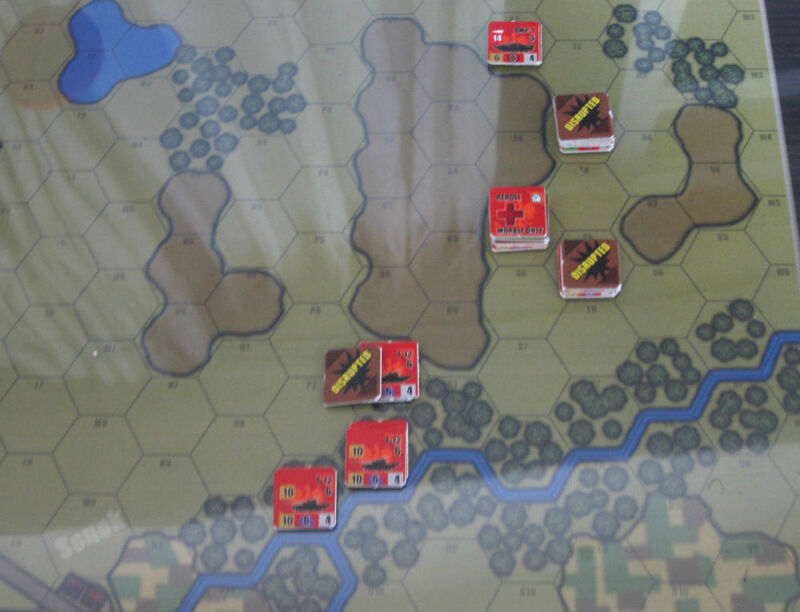 The Hungarians use opportunity fire but miss at a T-72 creeping towards the rolling terrain hex in N6. The Polish tanks use moving fire to hit the Hungarian infantry sitting in Ralocsa, reducing one infantry and disrupting the other in the stack. The Polish OT-64s in Zelin move west up towards Sonok and await the command to join in the assault on Ralocsa. 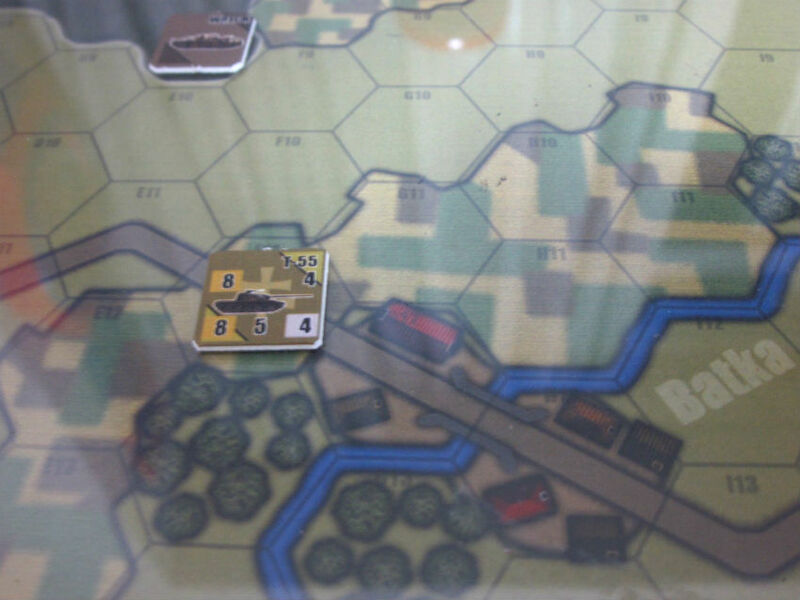 The Hungarians draw a T-55 for the reinforcement and move it just north of Batka, hoping to catch the OT-64s with opportunity fire should they move west next turn. The Hungarians place their focus marker on the Initiative box, hoping to get some early volleys of fire off next turn by winning initiative. They place their aid marker on the infantry in I6, knowing that these guys will have to rally in order to properly defend the city. The Poles keep their focus on initiative too. Since the marker has already been on there from last turn, it is flipped to the 'two re-rolls' side. The Polish player puts his Aid marker on the disrupted T-72 in Q7, hoping to get it going next turn. The advance elements of the Polish army stagger towards Ralocsa. The Poles get initiative this turn after the Hungarians try to reroll a '1' and roll the same result anyways. 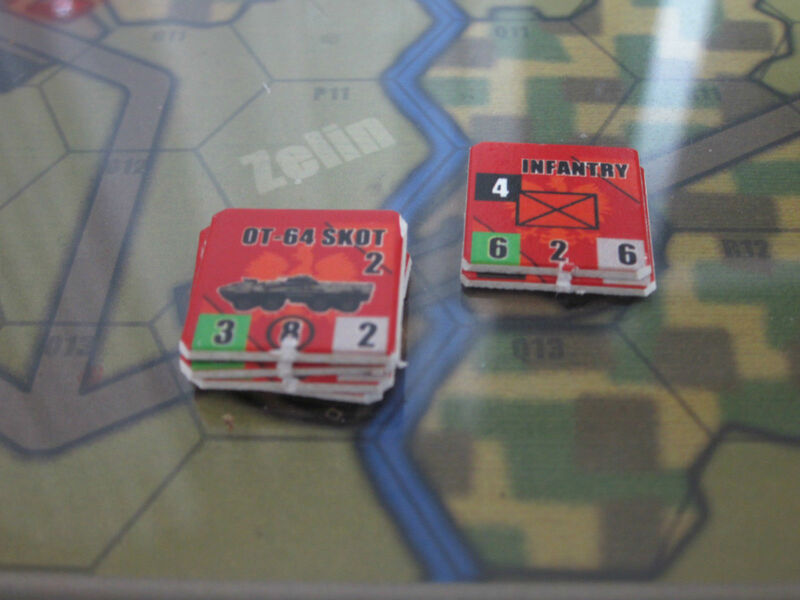 The Hungarian player gets a 'From the Hip' card, allowing infantry units to fire after moving. The Polish player gets 'Kill them All', so a selected unit can attack the same target twice. The Poles still have enormous problems rallying their remaining disruptions from the turn 1 chemical attack. A BMP and infantry in T3 remain disrupted. A T-72 in T5 is still disrupted. The T-72 in Q7 manages a rally after the Polish player initially fails the rally roll and then uses the Aid marker to reroll and pass the rally check. 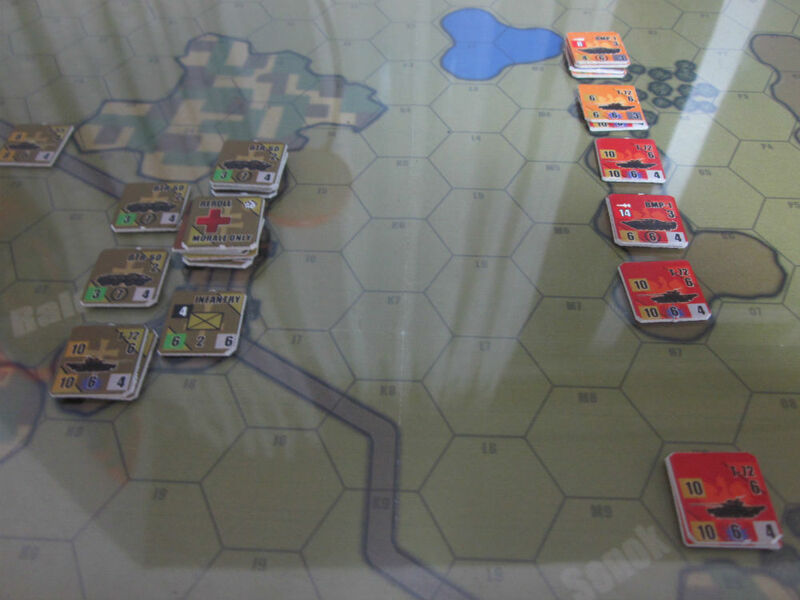 The Hungarians manage a lucky break and rally their infantry in Ralocsa after playing the 'For Izolda!' card. Duirng the Fire Phase, the Poles absolutely hammer on the Hungarian units defending Ralocsa. The Hungarians keep their cool even after the Polish player uses a 'Kill them All' card to fire at the T-72 sitting in H7. 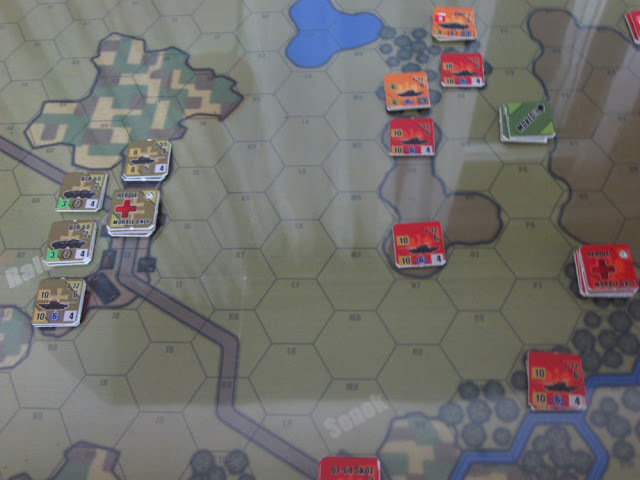 The Hungarians hold their fire and hope to use Opportunity Fire to catch the Poles during the movement phase.They draw a T-55 for a reinforcement and push it to F4. A BTR-60 jumps into I5 to help the defending infantry as the Poles draw nearer for the big assault. Infantry in H6 unloads into Ralocsa in I7, hoping to keep the encroaching Poles at bay. The shooting galley opens up near Ralocsa. A closer look at the situation near the objective. During the end phase, the Polish player removes his Aid marker and keeps the focus marker on Initiative. The Hungarian player puts the focus marker on his infantry and Sagger team in E6 since it has the best range and line of sight to enemy units. The Hungarians gain initiative this turn after rolling a 6. The player who did not have intiative in the previous turn gets it automatically in the case of a tie so there's no point in the Polish player wasting a Focus marker for a reroll. 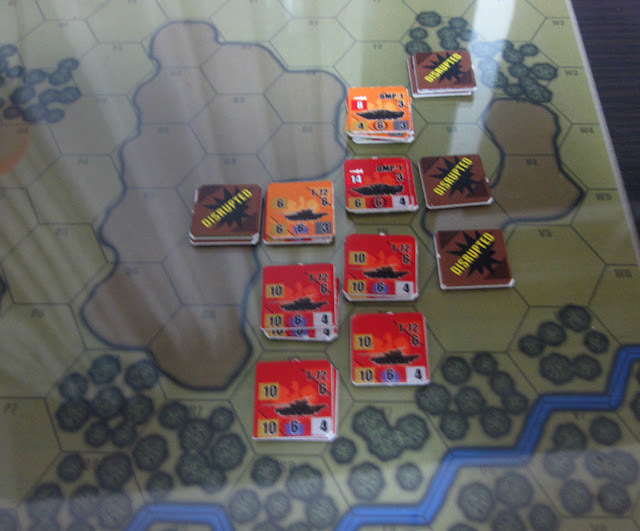 The Poles draw 'Fire Support' (+2 FP) and the Hungarians get an 'Opportunity Fire' card. All units except for a Polish T-72 in T5 manage a rally this turn. The Poles rule the Fire Phase this turn. A BMP-1 eliminates the T-55 in F11. A pair of T-72s fire on the infantry in I7 and eliminate it. Another T-72 in N4 eliminates an infantry unit and reduces the other in I6. The Hungarians start scraping the bottom of the barrel when a T-34 is drawn as a reinforcement and rushed to F11. In the Move phase, the Hungarians' brilliant plan falls apart when when the Polish tanks approach Ralocsa and the Sagger team runs out of ammo after playing an 'Opportunity Fire' card. The Polish T-72s go to work with moving fire and manage to disrupt infantry in H7. The OT-64s from Sonok are sent to the east side of Ralocsa and disembark. The Polish player slaps down his 'Za Polske!' card and the hits are doubled for close assault. By the end of the turn, Polish infantry are in the city. The Polish gain initiative after rerolling with the Focus marker. The Polish player gets a 'Nie!' card that negates the enemy player's card. 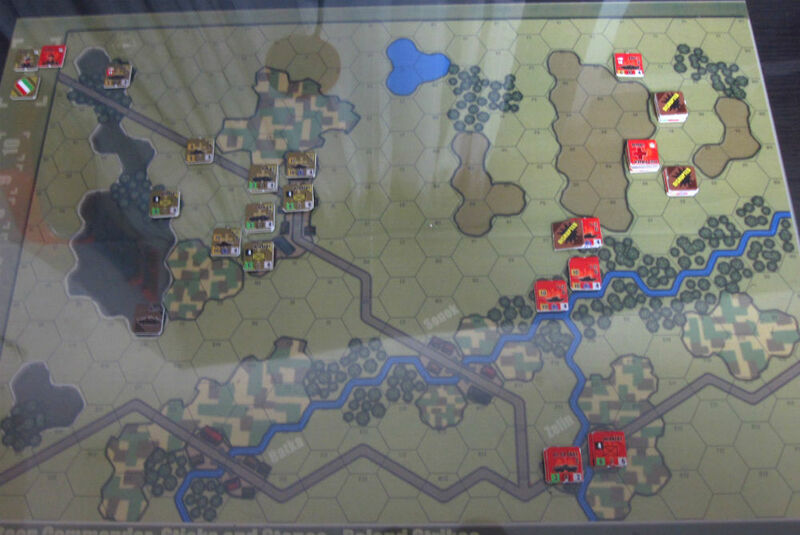 The Hungarians get 'Remember Budapest', which shifts the close assault column in their favor. The Poles go to work on the east side of the city, disrupting and reducing a BTR-60 and a T-55 in I5. During the move phase, the Polish get their tanks adjacent to the city but the BMP-1 with infantry are destroyed by the Hungarian sagger team in E6. Polish tanks and infantry line up to the north for an assault on the city. Another T-55 is drawn during the Hungarian move phase. The Poles have taken the city completely now. The Hungarians plan to use their remaining infantry in E6 to try and sneak up in the final turn and take back a city hex with a close assault. Hungary gains initiative this turn. A reduced Polish T-72 in I5 fails to rally so guess where the Hungarian infantry from E6 is going to try a close assault (just a note that I have a card in my possesion that gives the infantry 2 extra MP to get there this turn). The Hungarians fire at the Polish infantry in I6, hoping to disrupt it so as to keep it from opportunity firing at the Polish infantry approaching from E6. The rolls go horribly for the Hungarians and the Polish infantry is just fine. The Poles go to work taking apart the remaining Hungarian defenses near the city. They eliminate a Hungarian T-34 and a BTR during the fire phase. 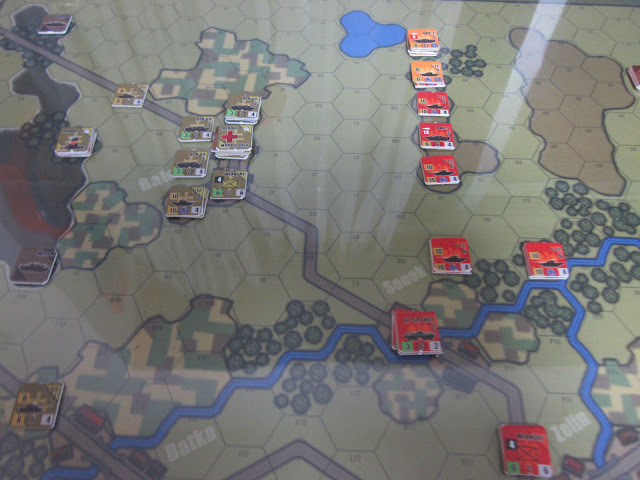 The Hungarians go first during the Movement phase and play 'Mozgas', which gives the infantry in E6 +2 MP. The infantry goes towards I5 for a last ditch assault on the city. The Hungarians attempt a last-ditch effort at gaining a hex of Ralocsa. Infantry in G5 move towards the city. The Poles play 'Opportunity Fire' and the Hungarian infantry takes 4 hits, eliminating it. The Poles chalk up a win for this one. Well, this was a classic case of setting up a thin static defense and hoping for the best. The Hungarians should have been able to hold at least one hex of the city. They had the advantage of terrain and the 'Chemical Warfare' card at the beginning of the game helped to stall the Polish forces for enough time. That being said, it seemed like the Hungarians just never knew what to do with those early advantages and the Poles regained momentum a bit later in the game after they gradually rallied their forces, and got back to work. The Sticks and Stones system is pretty good. I find it quite smooth to play once you get the hang of things. There are multiple phases in each turn but after a couple of scenarios, it comes pretty naturally and I rarely had to look up any of the rules. There is a lot of tension in the game, from where you place your focus and aid markers to the cards you draw and the priority of the enemy units you target during your Fire Phase. I would recommend this game system to anyone interested in the theme or genre. 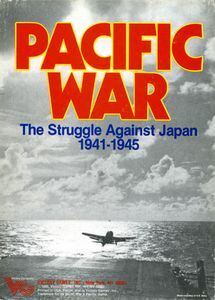 It feels much like the spiritual successor to the World at War series.